This book surveys many of the important topics in machine learning circa 1996. The intention was to pursue a middle ground between theory and practice. 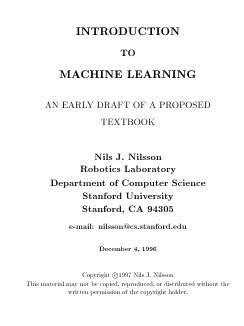 This book concentrates on the important ideas in machine learning -- it is neither a handbook of practice nor a compendium of theoretical proofs. The goal was to give the reader sufficient preparation to make the extensive literature on machine learning accessible. Introduction to Machine learning covering Statistical Inference (Bayes, EM, ML/MaxEnt duality), algebraic and spectral methods (PCA, LDA, CCA, Clustering), and PAC learning (the Formal model, VC dimension, Double Sampling theorem). This book describes and extends the scope of reinforcement learning. It also shows that there is already wide usage in numerous fields. Reinforcement learning can tackle control tasks that are too complex for traditional controllers. by Roberto Battiti, Mauro Brunato - Lionsolver, Inc.
Learning and Intelligent Optimization (LION) is the combination of learning from data and optimization applied to solve complex problems. This book is about increasing the automation level and connecting data directly to decisions and actions. Contents: Introduction and Main Principles; Background and Preliminaries; Knowledge discovery in Databases; Reasoning; Search Methods; Statistics; Main Learning Paradigms; Classification Tasks; Online Learning; Semi-supervised learning; etc.